Fusible plug blew on mini-split A/C, how to fix? I have a 2005 Mitsubishi mini-split that has been working OK but blew the fusible plug (on the low side just before compressor) this winter while it was in heating mode. Now I'm wondering what to do. I discovered the problem by blowing nitrogen into the service port (all the R-22 is long gone) and feel it come out straight the fusible plug. The service manual says zip. 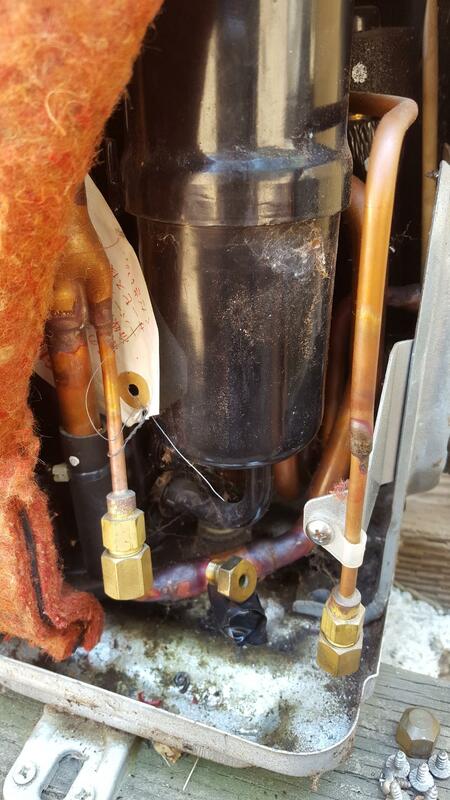 I gather this can be due to a blockage or to a refrigerant over-charge. I will see whether I can access the strainer. I'm not sure what else to do (or where to get a replacement plug given the unit's age). The last time the unit was serviced is in 2008 where a service tech tightened the flare nuts due to leakage and added refrigerant eyeballing it, so it could well have been overcharged. It was used more heavily this winter in heating mode than previous years, but it's still suspect to me that it would fail after this much time. Any thoughts/advice would be appreciated! NB: I know that getting a new R-22 charge is going to cost "a lot" but I also know that it's less than a new unit. Ok now with the photo that cleared things up, the fusable plug is a inexpensive overpresure protection. I haven't seen that in the past I was thinking you had an electrical plug that failed but since I hard wire I figured it was something I had not seen. Once you have the replacement installed. It would be a good idea to replace the filter dryer. pump the system with a little r22 to be used as a leak check gas then nitrogen up to 100 psi and check for leaks. If no leaks check for acid in the oil since the system has been open to atmosphere. No acid pump the system down below 500 microns. Failure to do this you will be trashing the compressor due to atmospheric moisture that will cause acid and that acid eats the varnish off the motor windings then the compressor is toast. Verify the system will hold at 500 microns or less. If the system holds a vacuum you are ready to recharge If it is not holding keep the vacuum on the system under vacuum as it may be the water boiling out of the oil. Once a stable vacuum. Recharge by weighing in the charge and it should be good to go. If the acid test shows positive the system needs to be tested with a megger in fact this could be done at the very first step to verify the compressor is good. Low value from motor lead to ground the windings are already toast, I use 10 mega ohms to ground as a minimum anything over 50 mega ohms at 500v is good. Added to answer question to long for comment.I use quick shot acid test if the paper turns red it has acid you can use the pressure of the n2. If the windings test good to ground you can flush quick shot makes a product that works well, I would be berry surprised if there is not a filter dryer some are not much larger than a 10$ cigar , sorry that's the only comparison I can think of. With acid in the system I don't think I would recharge until the system is flushed as acid in a running system can eat the varnish in less than 72 hours and to recover you would need to recover with a filter dryer prior to your recovery machine to protect the recovery machine then flush the machine. Not the answer you're looking for? Browse other questions tagged hvac air-conditioning mini-split or ask your own question. What is causing that buzz when running my mini-split air conditioner? Mini Split Condenser in Garage? With ventilation? Mini-split HVAC in new build?